After my last post you might think that I am against creating music. Not true. I am only against young children trying to compose music in groups with little to no teacher direction. Improvising is different. When you improvise, there is already a structure scaffolding for you and you just have to play in the gaps where there is no scaffolding. For example, if you play “Old Mac Donald had a farm” using the pentatonic scale, children can improvise between each verse. So, by rote you can teach all the children “FFFCDDC AAGGF” which they all play together twice. Then one child, or a pair (or dare I say it, a small group) can make up a eight bar improvisation between the tune using the notes CDFG and A. To do this you really require quite a few xylophones or metallophones where you can take the bars off – you really need to get rid of the B’s and the E’s to make a good sound. Then after the improvisation, the tune can return which is played by all children meaning that all children can be involved in music making. This can be repeated in Rondo Form where the tune is section A and each improvisation a new section. This does require a music room with tuned percussion instruments which I am lucky to have. I understand that many teachers will not have this. You can do the same thing using only rhythm if you only have untuned percussion instruments. Everyone learns a two bar rhythm by rote and then individuals, pairs or groups can improvise a rhythm sandwiched by the rote-learned rhythm. If you have no untuned instruments you can do the same thing using body percussion or just clapping. I try to have improvising once a half term. By Year 2, all children should be comfortable to improvise a short melody or rhythm without any teacher direction. Well that’s the aim anyway! Composition in primary schools is a farce. What composition is supposed to be, is an opportunity to create music for a solo performer or group of people. It requires some considerable domain knowledge, good performance skills and good aural skills to do well. What we have in primary schools is “experimental time” where children are put in small groups and then mess around with instruments and sounds. This is called composition although it has almost no similarity to the real thing. Everyone who believes in primary school composition will complain about my definition and say that is an unfair portrayal. However, in 14 years of teaching music in schools, I am yet to see a successful composition lesson. Really good teachers will blame themselves, the kids, SLT, the school or even the government before they blame the nature of group work. Just to clarify, most composition tasks in KS1, 2 or 3 involve children being put or putting themselves into groups of 4 or 5 to compose music to a task set by a teacher. It simply does not work due to the nature of sound and the nature of group dynamics. In a smallish room you cannot hear yourselves play so when everyone is playing different things at the same time you will rarely be successful. Group dynamics means that whenever any group of people get together, there are so many other things to talk about. Why do the work set when you can continue your conversation from lunch time? So little work ever gets done in composition lessons. But there is this crazy sense that we are failing teachers if we say group work is crap so we end up with everyone agreeing with something that deep down they know is a really bad educational idea. I would not be so against it if I knew it worked but like I have said, I have never seen it work well. Ever. So this time which could be used on aural work, singing or performance is wasted. The kids who want to get good grades hate it as they have to do all the work as their peers can’t be bothered/do not have the skills. Some kids are bored. Others get into a cathagic state where they hit instruments with no thought process going on. Let’s just abolish it until kids are 14. You will see standards rise and more people take the subject for GCSE. It’s quite a good video as young children love to see other children playing music as they really think if they can do it so can they. I introduced the word “brass” so the children could identify the instrument family. The children knew the song and started singing it half way through which was great – after I talked a little bit about the trumpet we sang “Old MacDonald”. We talked about valves and “buzzing” to make a sound – a good excuse to make some funny noises! I also used the word “accompaniment” and asked the children if they could identify the instrument that the teacher was playing with the child. We had some good guesses with “guitar” and “piano” but in the end I had to tell them it was a harp and show them a picture from a Google image search. Just to clarify – Instrument of the Week is a pre-lesson starter so the children can walk in to music. It is time that the teacher can talk to a class teacher if there is something about the class that they need to know. If there is a child who is distressed or needs to be talked to then it gives time for the teacher to deal with it, in the knowledge that the other children are doing something constructive. If the lesson is one where one lesson backs on into another then it gives the teacher some time to put the room straight or their thoughts straight before embarking on a new class. The music is not more than a few minutes long and it is a good routine so the children can find their carpet spots and transition their minds into music-lesson mode. And finally it helps with my objective that by the end of Year 2 all pupils will know 40 instruments off by heart from sight and sound. Carpet spaces have worked. The children are so much happier now they know exactly where to sit in a lesson. There are no arguments and every child has their own personal space. Children who would wind each other up now have distance. After a singing game or instrumental activity they now know exactly where to go back to sitting within 10 seconds rather than 2 minutes. I can see exactly what every child is doing, what they can do and what they are struggling with. The children know you can’t avert the gaze of the teacher and any misbehaviour is caught and dealt with immediately. They can all see the white-board and I know who is concentrating and who is in la-la land. I’m happy with circle spots too if you are unhappy with the notion of three rows of children all looking forward. But will I ever go back to no set space? Never again. In the good ole’ days, Christmas was easy. Everyone knew the songs you did and the Christmas show was invariably the same. All you needed was a piano and some tea towels. Now it is a lot more complicated and there are certain things you can and cannot do. You cannot sing traditional songs – “Away in a Manger” is banned as it mentions the “Little Lord Jesus”. One head said we could sing it if we changed the word “Lord” to “child”. “While shepherd’s watched” is meaningless because they are not watching anything any more. You cannot mention Jesus – he is banned in many schools unless they are faith schools. You can mention Santa as much as you like. All music must be recorded in three formats – 1) normal speed with vocals, 2) normal speed without vocals and 3) slow speed for rehearsal. This has to be recorded as you would exactly play it on the piano on the concert day. A robot would be much more beneficial than a trained music teacher. The songs for Christmas will not be chosen by a music teacher but by someone who knows nothing about music. This person will then instruct the music teacher exactly what they have to play based on a 12 second audio recording from YouTube. This is no joke, this really did happen. The music will have to be re-scored for the purposes required in point 3, the key changed so the children can attempt to sing it, new words created so they scan properly and the whole thing reduced in difficulty as they are originally written for professional pop or opera singers. I have nothing against good quality non-religious Christmas concerts. It’s just depressing that most of the alternatives are pretty devoid of content. If you do want to do a non-traditional Christmas show I would recommend many of the publications by “Out of the Ark” rather than relying on Youtube. This week is the flute. A nice rendition of “Happy” by Pharrell Williams. Every week we have an instrument of the week. This week was the violin. The children recognised the music from the film and it fitted nicely into their topic on the seaside. I love the stands and how the beaters are laid neatly on the instruments. 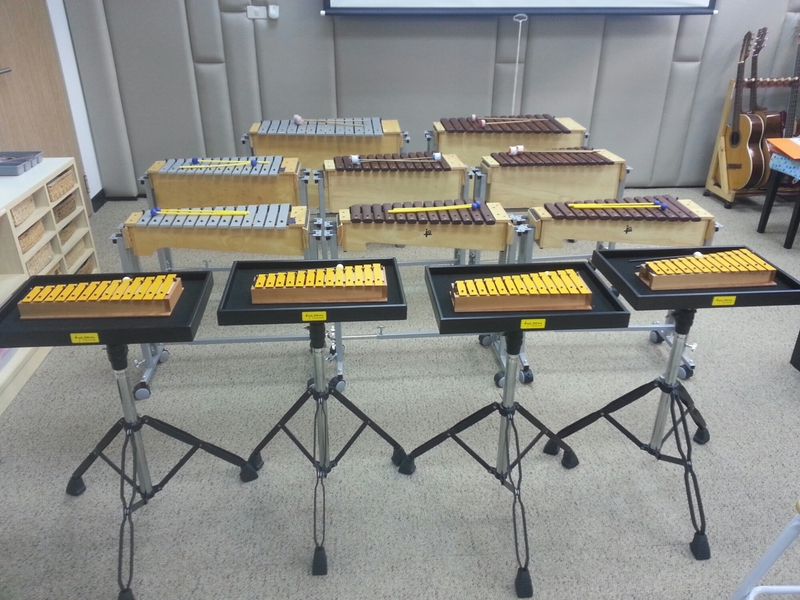 This is set up for 12 players and then the rest will play untuned percussion or singing. Would love to do this myself but will have to wait a few years to save up. I have made seating plans for all my Y1 and Y2 classes. It’s worked really well today. Basically I have surrounded our most distracted children with focused learners so they have noone to feed off. Let’s see how the rest of the week goes.